As one of the activities in our Study Guides, we ask students to examine closely Shakespeare’s vocabulary — because what they’ll discover is that it actually isn’t as alien as they fear. Shakespeare’s language is their language, not antiquated, not Old English, not in need of translation. One of the ways we introduce this idea to students, in our Study Guides as well as in workshops and lectures, is through the Wordle. 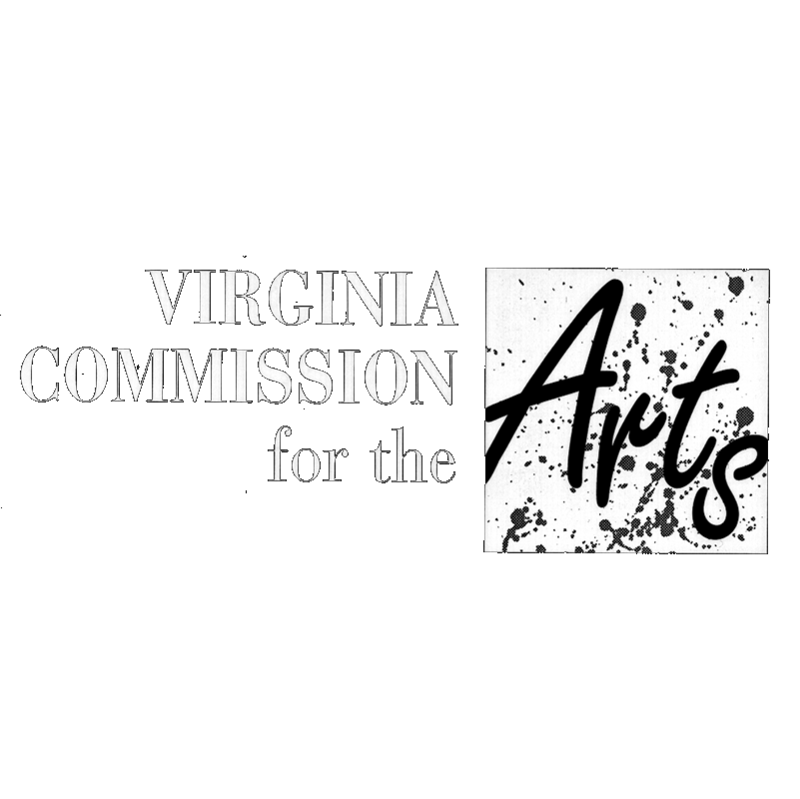 The Wordle program allows you to create a visual representation of a speech, a scene, or even an entire play, if you’re so inclined. The more times a word appears in the text, the larger that word will be relative to others on the page. Wordle automatically excludes articles and most pronouns (though it doesn’t recognize “thou” as a pronoun). Wordles help to show students that Shakespeare’s language is not really that far removed from their own — typically students are hard-pressed to find unfamiliar words in the bunch, apart from character or place names. What makes Shakespeare “difficult” is not the vocabulary, but rather the syntax and word order, the way he constructs his ideas, and that is almost always to a purpose (which we explore further in the rhetoric section of the Study Guides). Wordles can also provide an insight into other aspects of the language, especially if you look at a single speech or a smaller portion of a scene. They might point to a dominating concept or idea. They might tell you what characters are the focus of the selection. They can even impart a sense of mood, based on the vocabulary — on whether there are a lot of names, or an abundance of informal pronouns, or almost entirely active verbs. To help teachers with this idea, we created Wordles for the first 100 lines of each of the plays I’m building a guide for this year. 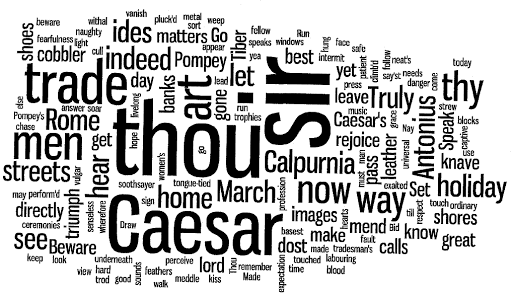 So far, I’ve taken a good, close look at Julius Caesar, Hamlet, A Midsummer Night’s Dream, and Henry V. When preparing the text for conversion, I edited out the speech prefixes and stage directions, so that the Wordle would include only those words that the audience hears. I was surprised, looking at some of them, to see what that exercise told me about the first five minutes of these plays. In many cases, it’s easy to see just what the focus of the scene is — who’s important, what they’re talking about, what issues are at stake. 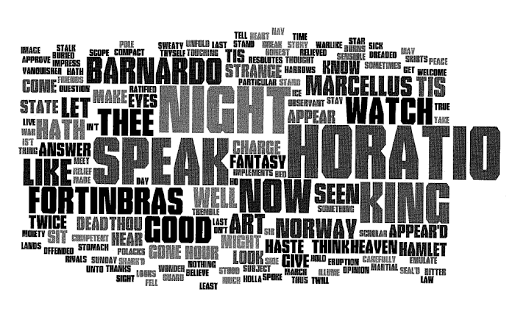 These Wordles crystallize the ways in which Shakespeare introduces the audience to the world he’s bringing them into. The two largest words are “thou” and “sir” — indicating, just at a glance, that the conversational partners are not of equal social status. “Sir” is a term of respect (even if it might be sarcastically delivered), and “thou” indicates informality, either to an intimate or an inferior. The juxtaposition with “sir” would make me think, even if I didn’t know who the characters were, that this “thou” marks a status distinction, not intimacy. The next biggest word is “Caesar” — unsurprising, since even though he does not have the bulk of the play’s lines, he is the focus of the play’s action. Everything that happens in it derives from his actions, his importance, his dominance over Rome. The audience hears his names many times before he even appears on the stage. Horatio is the highest-ranking person in the first scene, but, unlike with Caesar, the repetition of his name does not directly reflect his status or relative importance. Instead, it stems from Barnardo and Marcellus calling on him to interact with the Ghost, pushing him forward as the earthly representative to their supernatural visitor (an element I’ve always found highly humorous). Another interesting thing to do with this Wordle is to go through and pick out all the words related to some sort of sensory perception: look, hear, speak, eyes, appear, etc. Deprived of sight in this dark scene, the characters nonetheless seem obsessed with seeing and visions — but they also compensate for the impairment of one sense by relying heavily on another. This scene is also full of imperatives, as the Wordle shows — all of the characters issue commands. Taken together, these clues provide insight into the pace and mood of the first scene. 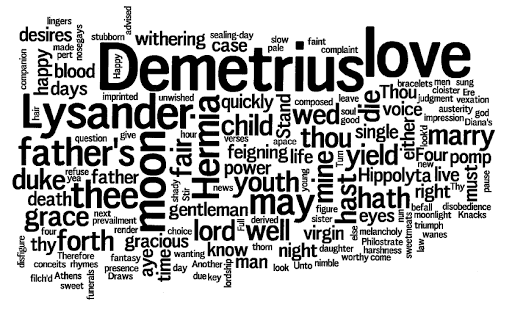 Several names feature prominently: Demetrius, Lysander, Hermia — and many of the other large words describe relationships: father, child, wed, marry, love. Right from the start, this play is a tangled mess of who relates to whom (and who would like to). I’m also intrigued by the relatively large size of the word “may” — a word that could mean so many things. In this scene, I believe it refers both to permission and to possibility — what Hermia may do, as allowed by her father, the duke, and Athenian law, and what may happen in the future, whether she obeys those rulings or not. This is the only Wordle out of the set I’ve been working with where I wouldn’t immediately know which play it’s from just by glancing at it. No names feature prominently — a stark contrast to the three previous examples. 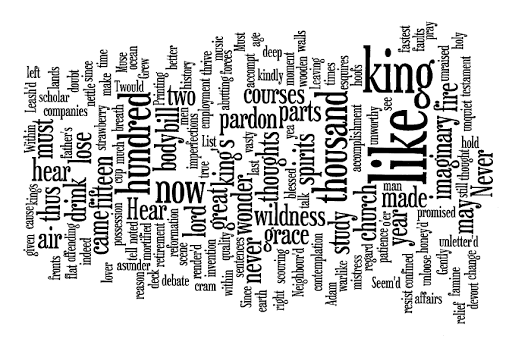 Still, the Wordle does give you a sense of the matter at hand through the two larges words: “king” and “like.” The first 100 lines of Henry V covers both the Chorus’s prologue and about 60-odd lines of the opening conversation between the Bishops of Canterbury and Ely. Both the prologue and the dialogue concern themselves with one main topic: what is the king like? What did he used to be like, and what is he like now? 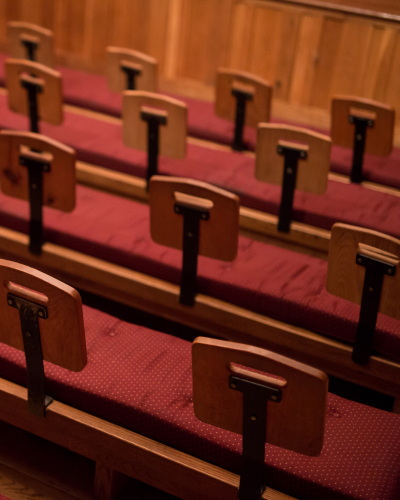 Both the Chorus and the Bishops offer the audience any number of analogies and examples with florid vocabulary — the reason why there seem to be fewer larger words here than in the other Wordles. The vocabulary of the first 100 lines of Henry V is more diverse than in the other plays I’ve looked at so far. Wordles aren’t a catch-all. They won’t always cut straight to the matter or offer particularly valuable insights, and they certainly shouldn’t become a substitute for actually studying the lines of the play and looking at the words in context. They can, however, be a useful supplementary tool, providing avenues of creative exploration. For this reason, we recommend them to teachers, to help combat ShakesFear in their students — and I recommend them as an interesting graphical toy to any readers who are always looking for new ways to play around with the text. Great point of departure for the plays (and much good work on your part, Cass). I wonder: Did you remove speaker cues from the first 100 lines of Hamlet?  @Tim – Yes, I removed all speech prefixes and stage directions. The only words in the Wordle are those spoken aloud by a character. What do you read my lord?Wordles, wordles, wordles.Great post. It makes me wonder what this activity would reveal about other plays.